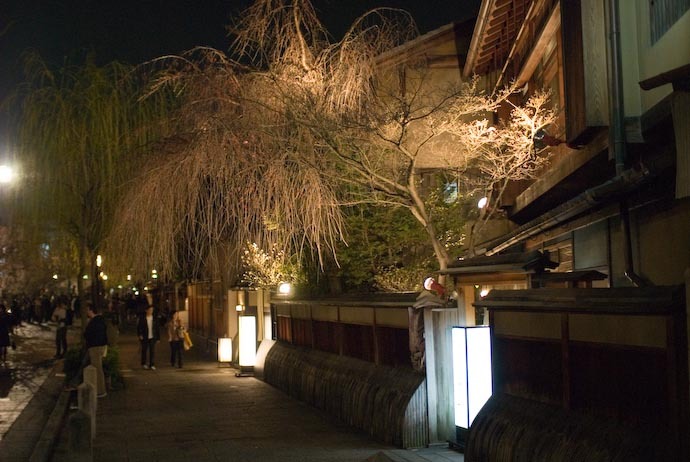 The dinner party I went to yesterday was right in the middle of Gion, Kyoto's traditional area for maiko and geisha. We ate at a simple okonomiyaki restaurant on the Shirakawa river (the river that runs next to my place, but a kilometer downstream), just off a street whose name translates, literally, to “Cherry-Blossom-Viewing Lane”. 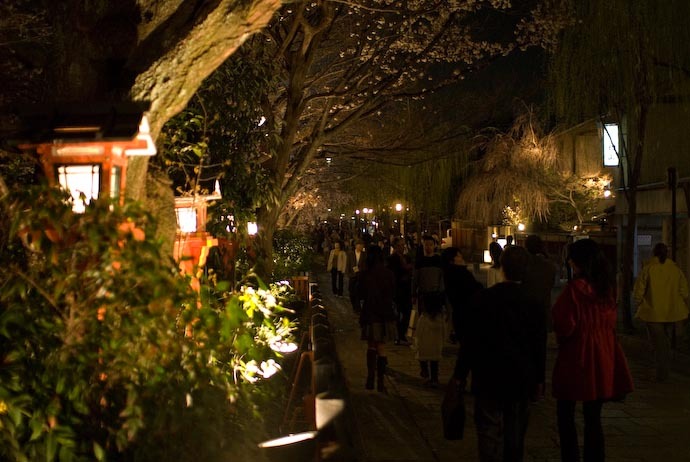 The immediate area has a lot of traditional architecture, cobblestone streets, and the river overhung with cherry trees just starting to blossom, so you can imagine the photographic potential. So can everyone else, which is why I was surprised that it wasn't super crowded. I'm sure that'll change next week as the blossoms really start to come in. 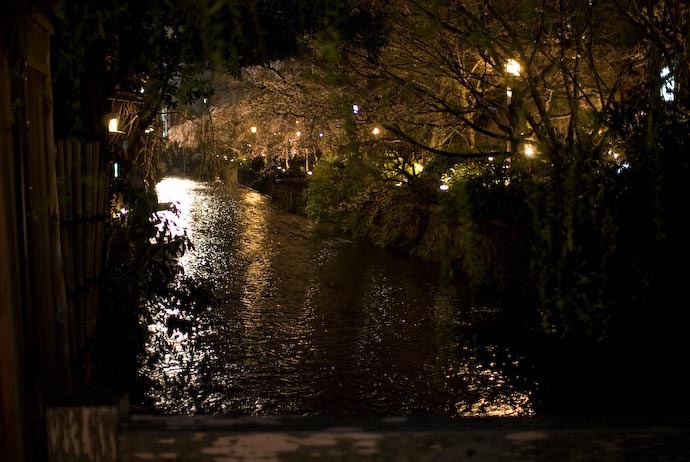 The picture above is from one end of a bridge going over the river, and is pretty much what you see when you step out of the restaurant. The trees along the right are mostly-bare cherry trees, with some spatterings of blossoms. 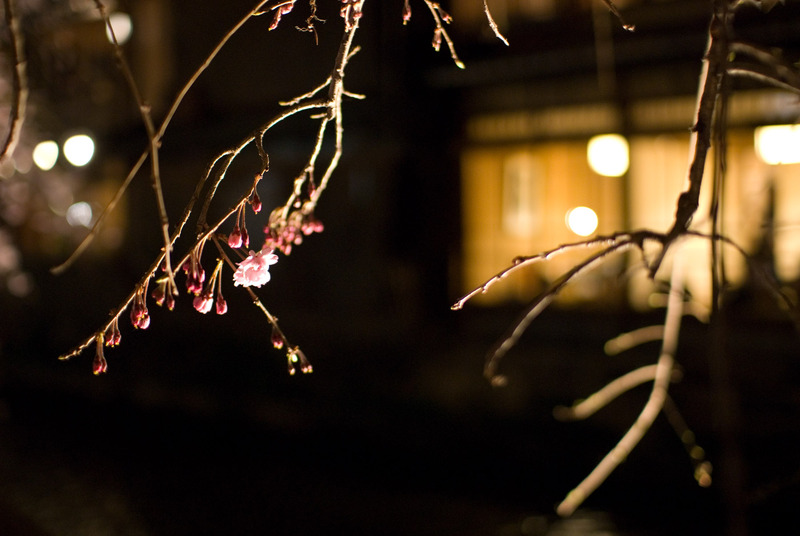 The tree is nicely lit up, but still without blossoms. 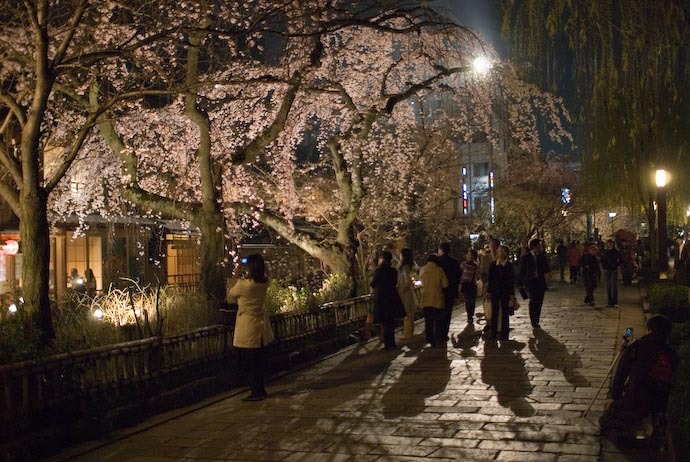 It's of the “shidarezakura” variety, which is essentially a cherry tree like a weeping willow. Across the street again, and down a bit further, one of the trees overhanging the river has some blossoms, and an ever-changing throng of people snapping pictures of it. It actually doesn't look too bad in the picture above, but you have to realize that a cherry tree with only a few blossoms is like a moulting dog losing its hair to some sickness. The few rough tufts of hair give no hint of the big shaggy dog that was, and perhaps look worse than a bald dog. I have no doubt that by next week the tree will be spectacular and awe-inspiring in the original sense of the word, but at this point it's not much to look at. Here's a closeup, looking to one of the restaurants lining the other side of the river. Even with ISO at 640 and f/1.4, it was still a 1/40th second shot, and so it's not very sharp. Of course, I should have had a tripod if I wanted a clear shot, but I didn't have one with me. I am writing you from Shanghai, China, where I am living at the moment. I discovered your blog one evening when I was feeling “homesick” for Japan, and Kyoto in particular. I put homesick in quotes since I am not Japanese—just one of the legions of Japanophiles around the world. I must thank you for the wonderful photos you have posted for the enjoyment of many. I have visited Japan numerous times in my life—the first time when I was 11 years old. I am now 63—so you can see this is a lifelong love affair with that country. I stumbled on to your blog—I must have googled Kyoto images—where you cheekily commented that you hate where you live. Indeed!!! I hasten to add that I also enjoy your family photos. Anthony is adorable. What a fortunate child—his youth will be most lovingly recorded in pictures. Oh—my husband, of course, envies your camera(s) and the opportunities you have in photographing your surroundings in all seasons and lighting conditions. Please keep posting—we will continue to enjoy and be grateful. P.S. In case you are wondering, ananiashvili.com is a website we created and maintain for our favorite ballerina, and now our friend, Nina Ananiashvili. She is much admired by the Japanese and our last two trips to Japan coincided with her appearances there.